The American Humane Society has dedicated itself to helping animals in need. For them October is a month used to shine a light on all the dogs waiting for their forever homes. "If you haven’t yet experienced that remarkable power of the human-animal bond, American Humane encourages you to consider adopting a dog and finding out just how life-changing it can be,” says Dr. Robin Ganzert, president and CEO of American Humane. “With so many dogs in shelters all across our country available for adoption — and many of them never finding a safe, loving, forever home — adopting a dog will make you a hero, too." As pet owners and independent pet retailers you understand "the bond" Dr. Ganzert talks about. So, join in and do your part this month. Here are some easy ways you can participate in Adopt-a-Shelter-Dog Month in your store and encourage your customer to join in. Inspire your customers to support Adopt-a-Shelter Dog Month by donating to the American Humane Society or any local shelters to help dogs (and other pets) find new homes. They can also show support by participating in an event in their community to support their local shelter, or even donate their time and volunteer at one. There's always dogs that need walking, and hey, it's good for them as well! You can do something as simple as putting a donation jar at your register to encourage customers to drop some of their change in as a donation. Or you could ask customers if they would like to round up their totals to donate. 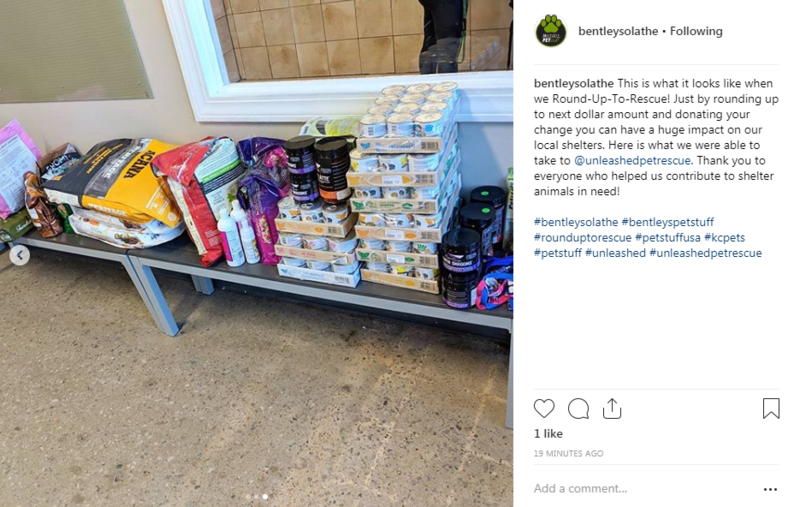 Here is a great example of donations made from rounding up to the next dollar and donating change at Bentley's Pet Stuff in Olathe,KS. To go a step further you can also get involved this month by partnering with your local shelter or foster groups for an adoption event at your store. You can set up a display with items that your local shelter may need and encourage your customers to purchase and donate them. "Rocco is a cuddly boy that needs more squeaky toys to play with and new bed to nap in." Seeing the faces of the animals the donations benefit can go a long way in encouraging people to donate, and maybe even adopt! If you do happen to partner with a local rescue group or shelter invite them into your store to host an adoption event. This can be a great opportunity to drive traffic to your store especially if both you and the group you are working together to advertise. Put up signage in your store in preparation for the event and make an announcement on your social media platforms. Use this eye catching sign to let your customers know when you will be hosting your next adoption event. Completely customizable to your store! Section off an area of your store or if the weather permits a section of your parking lot or sidewalk for families to meet with the adoptable pets. When families find their new best friend be ready to help them get all the essentials for their new dog. Promote your events on social media to draw in your current clientele and new customers looking to adopt. If you host an adoption make sure to share pictures of the newly adopted pets and their forever families during the event to try and drive more traffic to your store. Post pictures of an adoptable dog and tell their story like this one that has 259 shares! And great news! After months of searching for his new family Moose found his forever home. 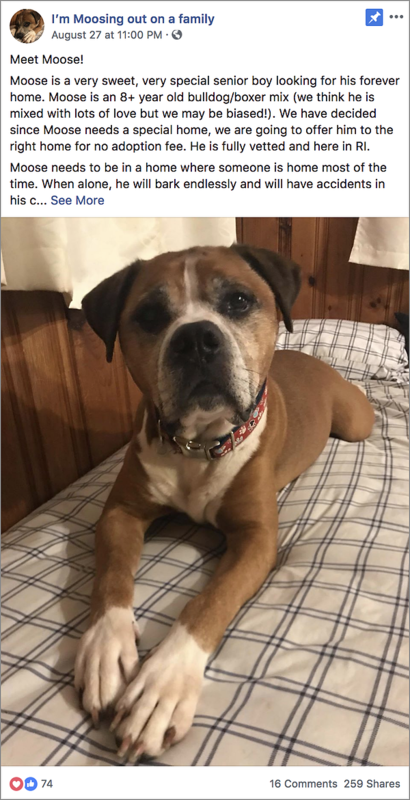 As a senior dog it was hard for Moose to find the right parents to take care of him in his old age, but shortly after this post he did just that! Welcome new pet parents in to your store and help them find everything they need to make the best forever home for their new dog. Maybe even offer a special discount to someone who has rescued a pet, highlight and reward their good deed, they will love that. Try building baskets for new pet owners to get them started. This way they have all the basics when they bring home their new family member, it also drives sales into your store, and helps build customer loyalty. 1. Dry food- Adoption groups will be feeding their animals food that you may not carry. This is your opportunity to educate a customer on some great options for their new pet. For example, if they are adopting a large breed senior dog make sure they are purchasing food appropriate for that dog. Maybe offer food that contains glucosamine and chondroiton for their aging hips and joints. 2. Leash, collar, and harness- Dogs being adopted may come in all shapes and sizes, but this is an opportunity to showcase all the different styles you carry. Maybe offer a comfort wrap harness for a barrel chested pit or bull dog mix. A tiny chihuahua may benefit from a traditional harness that goes over the head to prevent them from slipping an arm out. 3. Dog bed or blanket- Just like people prefer different mattresses, soft or firm, dogs also prefer different style beds. Is the dog more a sprawler or curler? A pillow bed or an orthopedic mat bed could work for sprawlers, especially older large breed dogs. For the pups that like to curl up tight a cuddler style bed would be best. For those pet parents who are happy to let their dog sleep on the couch or the end of the bed show them some soft blankets or furniture covers. 4.Training treats- When adopting a dog there will be an adjustment period and many dogs may have not received any training before so training treats are a necessity to reward good behavior. A small breed dog will need smaller treats and if they're older soft treats would be best. New owners of a large dog may want to buy in bulk so recommend biscuit style treats that they can purchase. 5. Toys and chews- These newly adopted pups are going to be excited or some might be anxious when they get brought home. So be ready to offer various toys and chews to new pet parents. Make sure to ask the new pet parents some questions so you can figure out what products to offer them. "Does the dog chew when anxious?" "Does he like to play tug of war?" Maybe the pet parents don't know the answers to all these questions yet, so offer them a variety. Recommend hard rubber toys and tough chews, rope toys for the tuggers, smaller soft toys for the little guys. Try to offer squeaky or crinkly toys also. 6. Food and water dishes- Pet parents are obviously going to need a place to feed their new pups. Even though it may seem simple and obvious you can still offer recommendations that may benefit a specific dog's eating experience. If the dog is a puppy that is expected to grow much larger you should offer an elevated feeder that can grow with your pet like this one from Messy Mutts. If the pup is smaller an elevated feeder is not ideal, but maybe offer a non-slip bowl to help prevent messes. These pet parents will come to you for help so make a good first impression and they'll be sure to come back and shop with you again. Great customer service is a huge part of building loyal customer advocates and it should start with a customer's first experience in your store. Now's the time to give your rescue some love and help pets who have yet to find their forever home. It can be as simple as a donation or as big as adopting a new dog, but help do your part this October for Adopt-a-Shelter-Dog Month. If you want to learn more about how you can support Adopt-a-Shelter-Dog Month and help the millions of dogs that need homes, visit the American Humane Society website. Share your ideas on how to support your local shelter below, we are all ears!